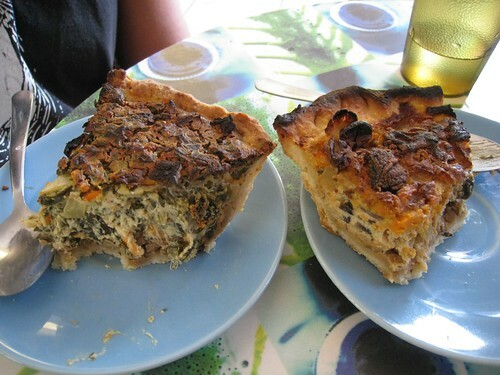 I absolutely recommend Somnio’s Cafe in South Austin. Locally grown organic food. Cute, cozy house with a nice ambiance. BYOB. Generous portions for a good price. You really can’t go wrong with this place. It’s a perfect place to bring a few friends, a bottle of wine or a few good beers, and a big appetite. 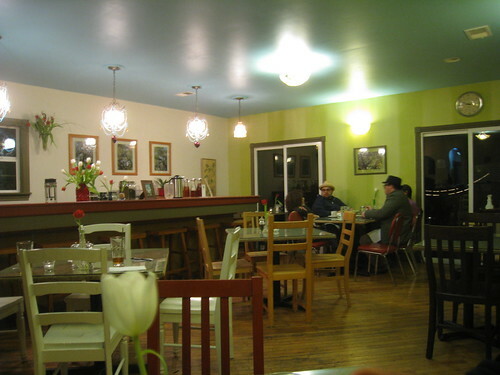 Somnio’s Cafe has a large selection of vegan/vegetarian options, but they also offer meat options as well (making it a great choice if you’re eating with carnivorous friends, family members, or coworkers who can’t handle a single meal without meat). 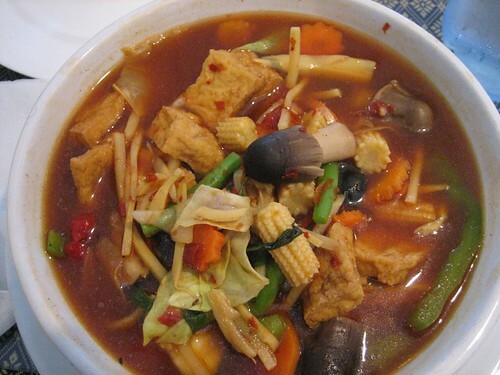 Vegan and vegetarian dishes are clearly marked and many of the veggie dishes can be prepared vegan if requested. 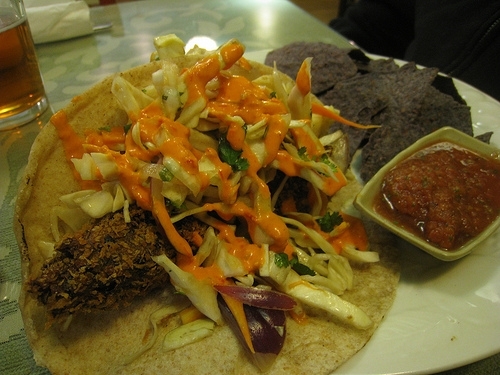 I highly recommend the Nynavae’s Tacos with panko crusted mushroom fritters. Very very good. I’m also a fan of the Sissy salad with apples, avocados, jalapeños and pecans. Yum! Somnio’s Cafe also always have some nice vegan specials, like giant bowls of vegetable curry. 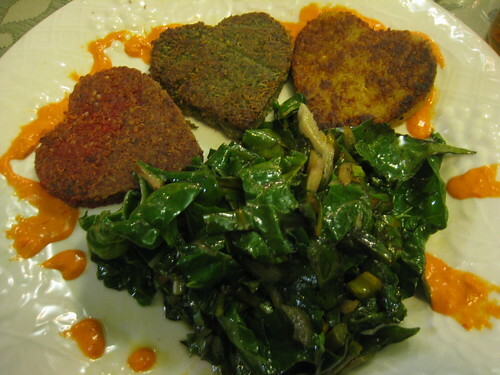 These heart-shaped quinoa cakes were part of their Valentine’s Day special. I tried their Sunday brunch once and I don’t think their tofu scramble is as good as the tofu scramble at Bouldin Creek Coffeehouse…but their breakfast bowl was still very tasty. I’ll definitely go back though when I’m in the mood for pancakes and fresh brewed fair trade coffee. A few years ago, the Hyde Park area was pretty lacking in the fast food breakfast/lunch offerings. There was a handful of good coffee shops, restaurants, and hang out spots…but the ready-to-go meal options (especially of the vegan variety) were in short supply. Lucky for me though, this has started to change. I live and work in the Hyde Park Area and now have a few great vegan trailers that I can walk to on my way to/from work. I’ve mentioned Counter Culture before. 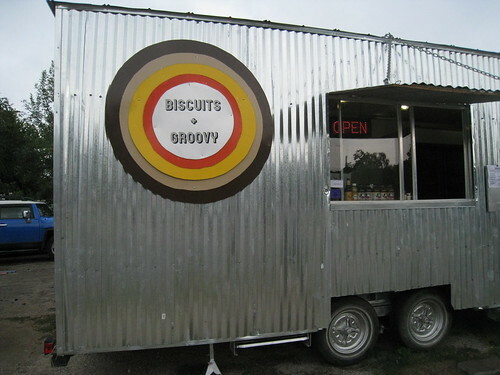 It’s great for lunch (because open most days at noon), but if I’m too lazy to cook breakfast and find myself hungry on my morning walk to work…now I can go to the Biscuits + Groovy Trailer (open most days from 8:30am-2pm). 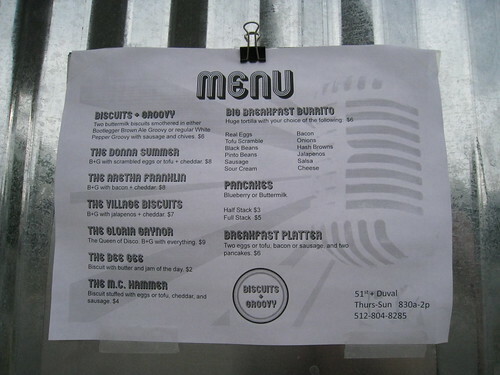 The Biscuits + Groovy trailer owner is vegan. 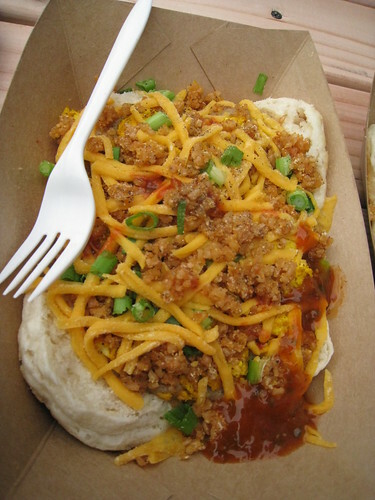 And while the food cart started as a strictly vegan cart, he has recently expanded his menu to include some meat. It’s too bad he couldn’t keep it all vegan, but I do understand the need to get a larger volume of people to give it an initial try. Judging by the reviews on yelp, the cart seems to be getting quite a bit of love from both vegans and non vegans, so that’s great. I do think he needs to clarify on his menu which items are vegan though (as it’s a bit tough to tell without asking him). 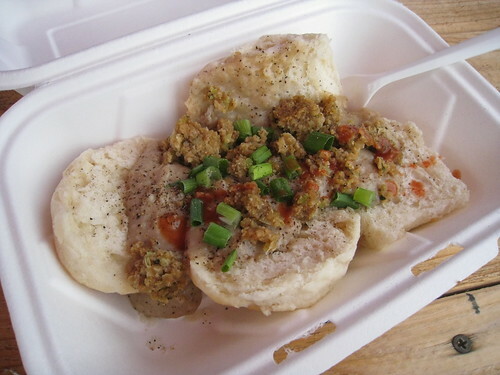 The first time I tried Biscuits + Groovy, I had the regular biscuits and gravy with a vegan sausage topping. 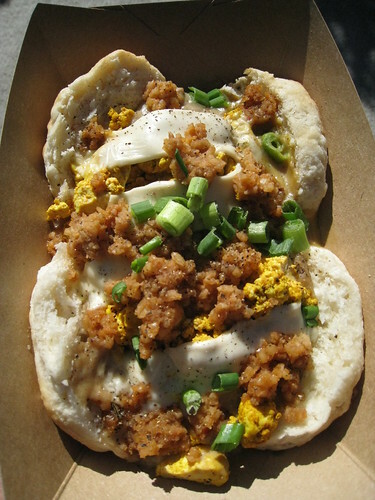 The next few times I tried it, I had the works: biscuits and gravy with vegan sausage, tofu scramble, vegan cheese, and green onions. Yum! I honestly don’t think the gravy is as rich and delicious as the vegan mushroom gravy Miguel makes as home, but it’s still good. And I personally love my own vegan tofu scramble a bit better. But with that said, I spend my workday mornings making biscuits and gravy with sausage, tofu scramble, and vegan cheese. So I have absolutely no complaints! I’m definitely super stoked this place exists – especially in my area. Also…John, the owner, is really friendly and the prices are reasonable. I foresee myself making quite a few more trips here on the mornings when I’m tired of my usual granola or breakfast tacos and am feeling like treating myself. I’ll continue to add to this post as I try more things on the menu. I’ve heard good things about the vegan philly cheese steak (which isn’t on the daily menu makes an occasional appearance from time to time). And I still need to try the pancakes…and the breakfast burrito…and all the other stuff. Ok, now I’m getting hungry. Hello everyone. 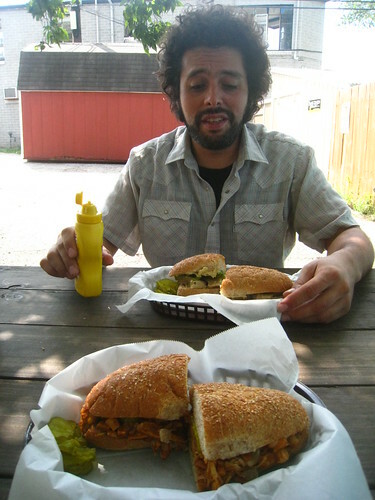 I’m settled back in Austin and ready to write about food again. And to recover from my year-long hiatus from this blog, I’m going to write about Counter Culture, a vegan and raw food trailer that recently sprung up on North Loop! Miguel and I had talked about starting a vegan trailer on that street, but I ended up leaving town for a year instead. I guess it turned out to be a good idea afterall. And based on the reviews the place has been getting, it seems to be pretty popular with the folks in the area. The cool thing about Counter Culture is that it has drawn a steady crowd of regulars who aren’t even vegan at all. Many of them may not have rushed over to try it had there been other options nearby. 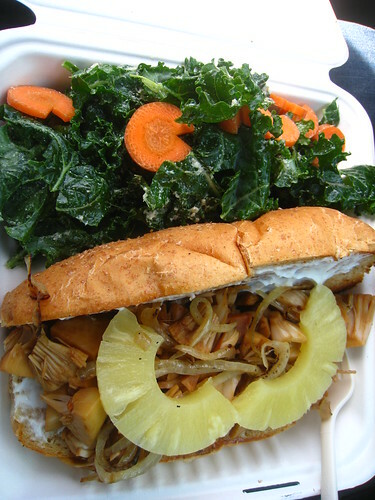 But since there’s practically nowhere else to eat a quick lunch in the area (especially food that’s healthy), the vegan cart has gotten quite a bit of attention from carnivores. AND since it’s just yummy food, these people (vegan or non vegan) continue to come back. I think that’s exciting! To all those people who had their doubts whether or not a vegan cart could be successful in Austin, this is encouraging news that it can. Anyway, I was super excited to try the place, so Miguel and I headed over to have a picnic lunch. We each ordered a different sandwich so we could try two different ones. 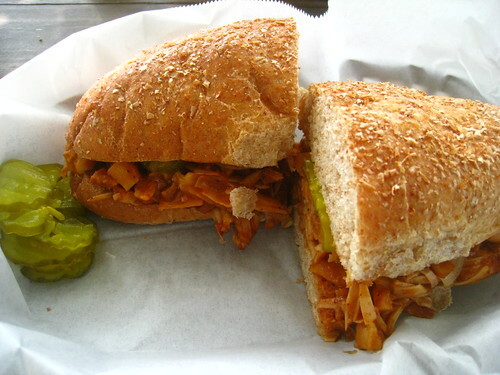 I ordered the Jackfruit BBQ. Not sure why Miguel has a weird expression on his face in this photo, because we both really liked the food. Luckily I work right down the street from this place, so I’m sure I’ll get a chance to try everything on the menu soon. My coworkers walk down to Counter Culture pretty regularly and they can all vouch for the trailer’s cleanliness, Sue’s friendliness, and the food’s deliciousness. Unfortunately it’s only open Thursday – Sunday…and those last few days in the work week are usually when I end up bringing my lunch. Hopefully she’ll extend her hours sometime in the near future. 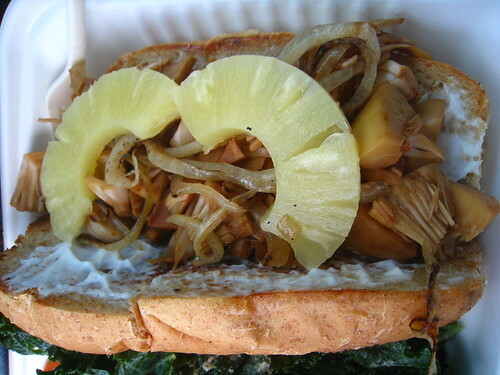 But basically…I’m pretty thrilled to see a vegan food trailer in my neighborhood. And if nonvegans are flocking to this place (and pleased with their experience), they’ll probably be more apt to try other vegan food as well. I forsee a gradual (but exciting) transformation within the greater Austin community. There’s no doubt that places like Counter Culture are helping to make the general Austin population more vegan/vegetarian friendly. 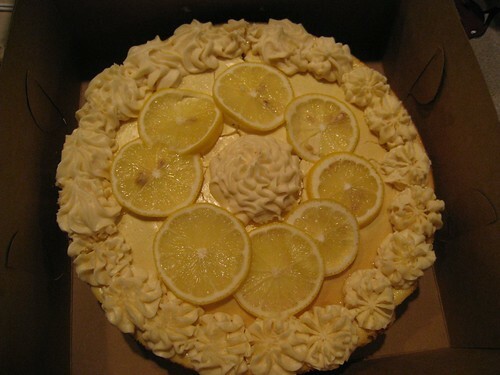 Dhaba Joy is a vegan bakery located next to 29th and Guadalupe, next to Toy Joy and across the street from Vulcan Video. The only thing not vegan about Dhaba Joy is that coffee drinks can be made with organic dairy milk instead of soy milk. Everything else about it though is 100% vegan. All the baked goods are vegan, all the sandwiches are vegan, they have a huge case full of delicious vegan creations, and their menu seems to grow and change each time I go in there. 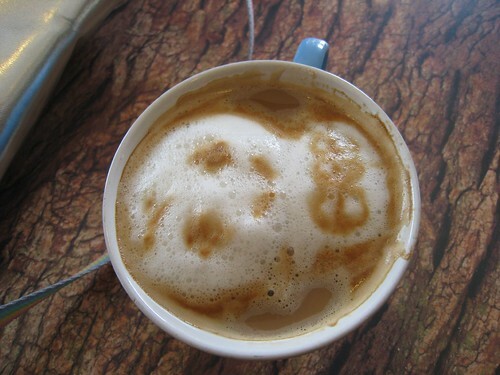 Their coffee is dark and strong – just as I like it. Their juices are also amazing. You can watch as they make them from fresh ingredients right in front of you. My favorite is the “Luck Now”, made with carrot, celery, ginger, and cayenne. Their ginger lemonade is also a good choice. This is a great place to take non vegans just to show them how flavorful and delicious vegan food can be. Occassionally I feel like they overcompensate by making things extra super duper sweet, but I think I’m probably alone in this opinion. 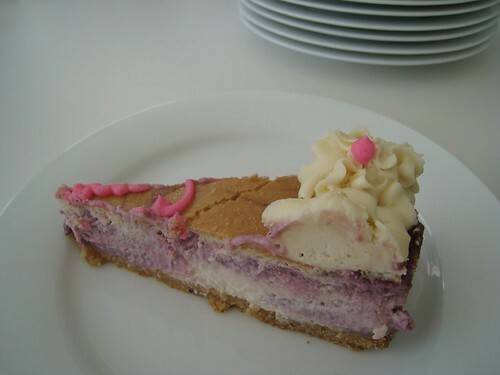 Most people like their deserts to be sweet, right? I guess I’m just not a huge fan of sweets. I think I’m also one of the few people in the world who don’t really like ice cream all that much….which is probably why I love their oatscreme swirl (their vegan ice cream that tastes more like blended, frozen oatmeal than ice cream). Dhaba joy seems to be growing! When they started, they had some vegan and some non vegan items. Now they only serve vegan items. 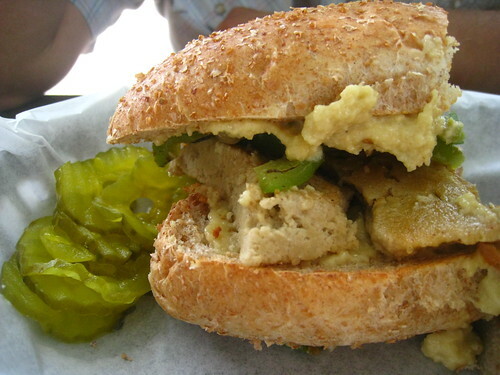 Next they added vegan sandwiches to the menu (like Tempeh Reuben, Chicken Salad, and some others). They also starting serving sushi, soups, salads, vegan mac and cheese, and a few other things. I think their slow, steady growth is a good approach and one that will prove to be successful for them. 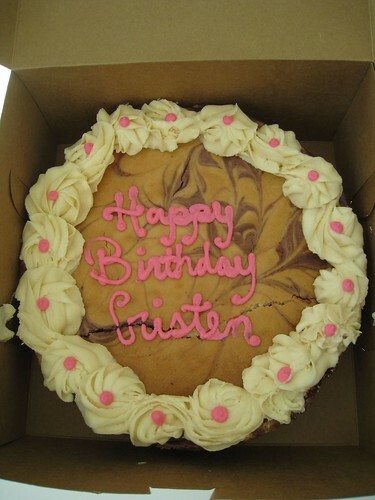 Now they even make large vegan cakes that can be ordered for parties (which I learned during my birthday). Being the spoiled birthday girl that I am, I got the pleasure of getting to try both of their cheesecakes. They were delicious, but I think I’m partial to the lemon one (the raspberry one was a tad bit too sweet). 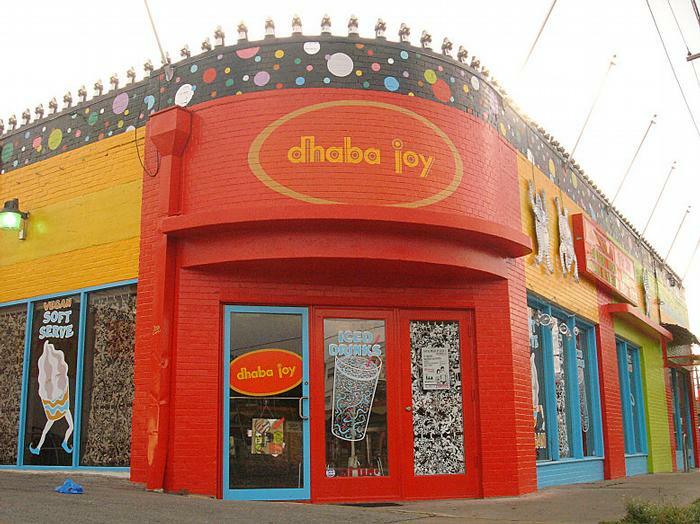 Oh, did I mention that Dhaba Joy is next to the best toy store in Austin? Toys and vegan goodies! Seriously, how can you go wrong with that? 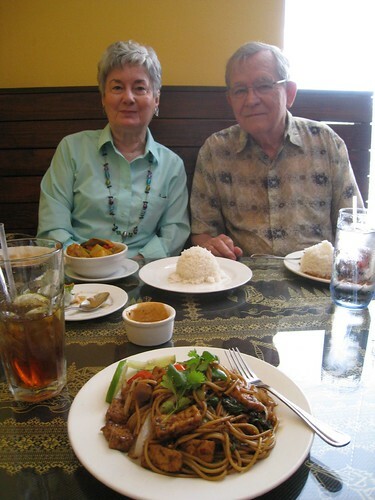 I really love Titaya’s Thai Cuisine. 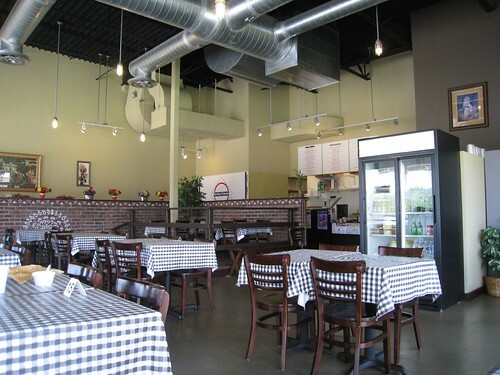 The restaurant is clean and comfortable, they have a great lunch special ($6.50, M-F from 11:00am to 3:00pm), and food portions are large and delicious. Another thing I like about this place is that when you order something extra spicy, they take you seriously and add lots of spice rather than assuming you don’t really mean it. 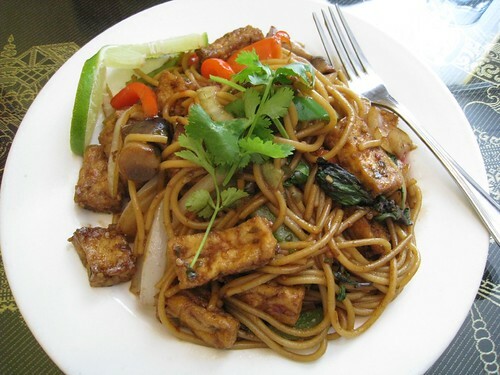 You can substitute tofu for every meal item and there’s a small notice at the bottom of the menu saying that all vegetarian and tofu dishes are automatically prepared vegan. I haven’t grilled the waitstaff about their definition of vegan – I’ve always just assumed (and hoped) that it is the same as mine. Next time I go, I should ask. The lunch special usually comes with a chicken coconut soup, but if you order a vegetarian dish they usually know to bring you a salad with peanut sauce instead. If they don’t mention the salad option though, remember to ask for it – as they may forget and try to serve you the chicken soup. There are sooo many options here for vegetarians and vegans. I’ve had the Gang Dang, Gang Musmun, Green Curry, Pad Cashew, Pad Ginger, and several others. I wish I had a photo of all these dishes, but I’m usually so excited to eat there that my camera is an afterthought. The waitresses at Titaya’s Thai Cuisine also make me happy. They’re really nice and helpful. If you’ve been there more than twice, they usually remember your face and greet you with a big smile. If you’re having trouble ordering, they’ll make suggestions for you based on your preferences and they’ll tell you honestly if they think a particular dish will taste weird with something added (I tried to add basil once to something and the waitress said she thought it was a bad idea. I appreciated that she didn’t just let me order it and end up disappointed). I go there pretty often with my grandparents. 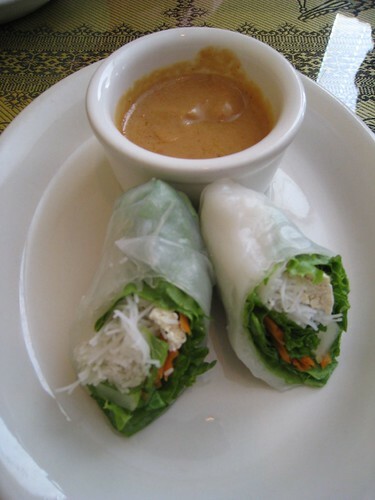 We always get spring rolls as an appetizer. Titaya’s recently opened and I’ve noticed that it’s been getting increasingly crowded during the weekdays. I’m glad that people are spreading the word about this great Thai place. This place makes me giddy and excited that I’ll be going to Thailand soon and I’ll get to eat Thai food every day for a month! 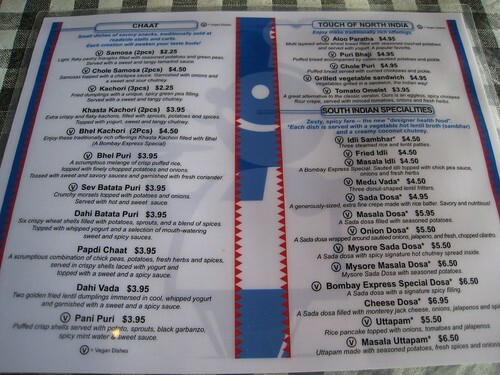 I just discovered Bombay Express recently because a coworker recommended it to me. (thanks Dale!) It’s located near Curry in Hurry on Parmer Lane, although it’s just off of I35. They’re open Tuesday through Sunday from 11:00am to 9:00pm. Like Curry in Hurry, Bombay Express also unfortunately uses Styrofoam containers and plastic silverware. Food is great though – I’ll definitely be back. 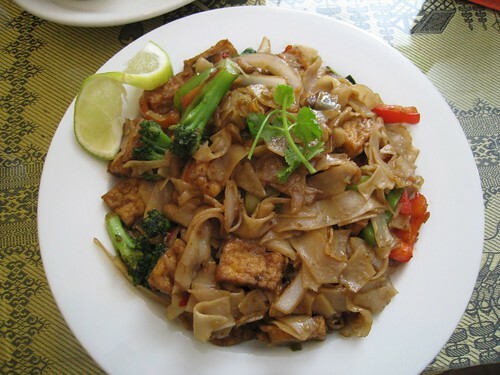 Everything is vegetarian, many items are vegan, vegan dishes are clearly labeled, and some vegetarian items can be prepared vegan upon request. It’s hard to go wrong with that. Plus – the employees were super nice. I couldn’t decide what I wanted so they offered to make me a vegan version of their vegetarian combo. Here’s their menu. There are so many other things to try, I’ll have to go back again soon. 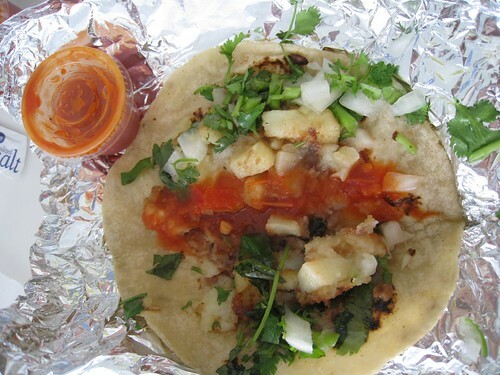 Taqueria la Canaria is a little taco stand on Airport and 51st street. I used to pass it every day to go to work. One day I decided to stop and check it out. 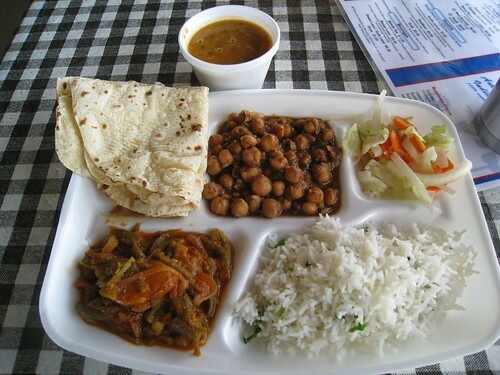 Although it is a very meat heavy place, their beans are vegetarian (no lard, no meat stock) and both the beans and potatoes are cooked with vegetable oil. Since they cook their food in a small cart, I imagine that the vegetables do touch surfaces where meat has been, but I didn’t watch them make my tacos so I can’t say for sure. If this is not ok with you, I’d probably avoid this place…but I don’t usually worry about that sort of thing. 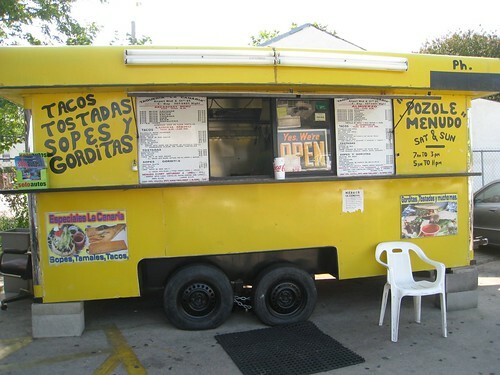 I’ve ordered tacos from this stand twice so far and both times service has been very very slow! If you’re not in a huge hurry, and if you’re in the area (I probably wouldn’t go far out of my way to eat here), the tacos are good, filling, and relatively cheap. 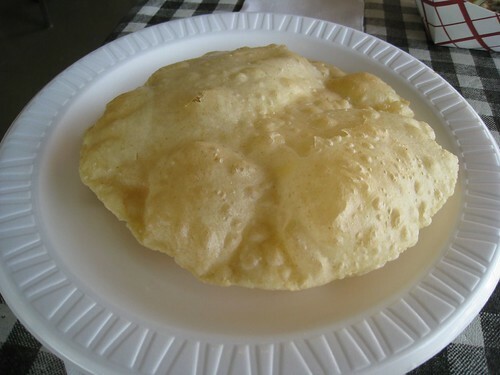 But, if you’re nearby and need a taco, it’s a good option – especially since the popular Tamale House nearby uses lard in their beans. The only vegan option is as follows: beans, potatoes, cilantro, and onion on corn tortillas. Their green salsa is yummy. And their tortillas are homemade! Not at all vegan, but perhaps I can do a similar taco journalism thing vegan style?